A Designer 18k Yellow Gold Rutilated Quartz and Diamond Pendant. 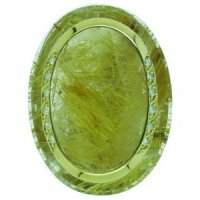 A creative pendant composed of a large oval Rutilated quartz, which has a rim of yellow gold within the surface of the stone. The rim is then further set with 12 small brilliant cut diamonds weighing approximately 0.15cts in total. All mounted in 18ct Yellow Gold. 750 -18k / 18ct.